If you are looking to grow your hair naturally, I’d suggest cutting your hair especially if you have used relaxer in your hair. Now, the way that you’d cut your hair is dependent on you. Some people opt for cutting their relaxed hair once it has grown out, others shave their whole head. It will hurt (emotionally, not physically) as you’d feel weird, but it will grow – I promise! I’d suggest getting a barber or hairdresser to cut your hair because doing it yourself may lead to an uneven set of hair which looks weird when it grows back. Next, you’re going to need to get rid of the relaxer and any heat products. In regards to the heat products, I mean you’ll need to lessen the amount of heat you use in your hair. This is dependent on your however, some people don't blow dry their hair at all whilst others lessen a number of times they do. I like to straighten my hair every other year or every other couple of months as a part of my “cut and blow dry” routine. It’s also a perfect way to see how far your hair has grown! Protective hairstyles will be your best friend. Protective hairstyles such as flat twists, braids or even weave in order to make sure that you are not handling your hair on an everyday basis whilst also limiting the amount of shedding in your hair. Make sure you keep your hair moisturised but not HEAVILY. Personally, I find that protective hairstyles help my hair grow especially if I keep them in for a while. It’s all about the pre-poo and the moisture. Now, it’s time for pre poo – pre pooing your hair essentially is putting in oils in your hair a day or an hour before you wash your hair. The reason behind this is to protect your hair, detangle your hair and to make it softer during/after your wash. Make sure that after you’ve washed your hair, you moisturised it with natural oils or using the Cantu Beauty or Shea Moisture hair care line will ensure that your hair is locked and sealed! 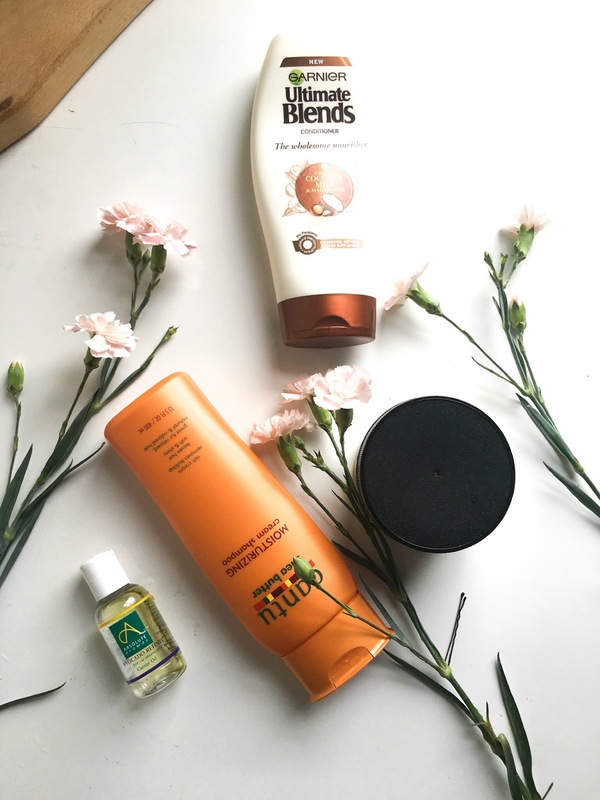 I've spoken about why I love the Shea Moisture line before, worth the read! In order to get your hair thick, you will need castor oil. Castor oil is just for the hair on your head but eyebrows as well - castor oil not only helps grow your oil but makes it extremely thick. Massaging a bit of castor oil in your hair will improve circulation which causes the growth. You can use this as it is or as a hot oil treatment during your wash day. Castor oil for me has made my hair grow incredibily thick to which I had to stop using it because it was getting out of hand - yes, that's how great it is! Wash days literally mean wash days. For those who don't know what a "wash day" is a day dedicated to washing, treating, conditioning and moisturising your locks. You might be reading this and think that this can be done in under an hour but this will take some time. This day is all about detangling, cleansing and moisturising - I'd suggest scheduling a day out for your time to do this. Make sure when picking out the conditioners/shampoos/oils, that they have benefits and healthy ingredients in your hair. Some products work better for other people, so find products that work better for you! Cutting your hair and starting this is going to be hard because you have to stick to a routine, for a very long time I regretted cutting my hair. I didn’t like how I looked and was concerned that my hair wasn’t growing. It’s all about time, just wait and it will grow. Trust me, it will grow! Growing natural hair is hard, but it's rewarding. Don't give up on it! Have you started your natural hair journey? I am still growing my hair, any more tips for those who are starting a natural hair journey? Is The Instagram Business Account Worth It?